Although I absolutely LOVE waffles and pancakes on the weekends, overnight oats are my go to on the weekdays. I eat them almost everyday and have posted my Coconutty Pineapple Overnight Oats on the blog already. Why are they my favorite weekday go to breakfast? Well, the short explanation is that it is a cold version of oatmeal. It tasted amazing and involves absolutely NO cooking! You just mix ingredients together and let the oats or oat bran soften in the refrigerator overnight (hence the name). Then just eat cold! Overnight oats are great for meal prep and when you are on the go! Mix all the ingredients together and layer with blueberries. Refrigerate overnight and eat cold! This recipe can easily be doubled or tripled and stored in the refrigerator. 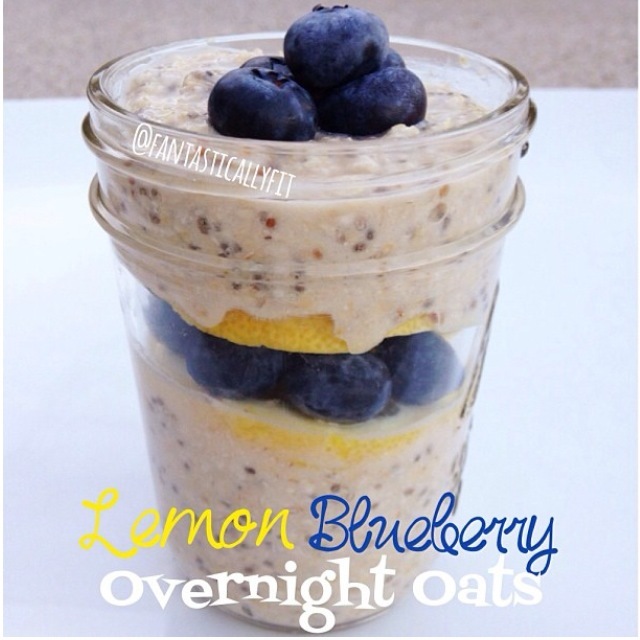 9 Responses to "Vegan Lemon Blueberry Overnight Oats"
I was wondering how long can u prep overnight oats for? I like to do meal prep on Sundays to last me til sat at the max. Hi Melissa!The most I have done is 3 days in advance. But I am sure you could go longer. It also depends on which fruit you use. Hello! I’m really wanting to try About Time but have a big question! I’m lactose intolerant (I can handle some dairy but only with a Lactaid pill…) which powder do you recommend? Aside from the vegan powder, they all have some dairy in them right? If not, can you recommend your favorite? I’m really excited to try! Thanks so much!! I would recommend looking at the ingredient list on the website. But, all of their protein powders are lactose free! Which is awesome. However, they are whey which is a dairy unless you get the vegan protein powder they have which is completely dairy free. I am very sensitive to dairy as well. Aside from greek yogurt and cottage cheese everything dairy upsets my stomach. Most other protein powders upset my stomach but About Time does not upset my stomach at all! You can also order samples of their flavors before committing to a large tub and see if it upsets your stomach before committing to a large tub. My 25% off code: fantasticallyfit works on all products including the samples I hope that helps! I made this last night and tasted it this morning…I must have done something wrong. Or maybe my scoop of protein powder was too big? It is VERY powdery tasting. I’m sorry to hear that. It must be the brand of protein powder. Many people have re-made this and loved it. Maybe try the brand that I use? It is all-natural, great flavor, and not so over powering.